This week I share 5 ways to stay front of mind with your customers. Segment 2: 5 ways to stay front of mind with your customers. Why hello there everybody. This is Adam Silver, your host of the Kitchen Sink WP Podcast. Thanks for being here, let's get started. All right, first and foremost, we have upcoming events next weekend, the weekend of March 12th and 13th. We have Work Camp Mumbai and I am not going to that one. It's a little far out of my range as far as financial, really. If I could afford it, I would go, that's awesome. We're at Camp Mumbai is next weekend. This weekend we had Lancaster, PA and also Dayton. If you were there, hope you had a great time. I didn't get to go but I missed a lot of friends that were at Dayton. I didn't know anybody … Actually, I knew a few people at Lancaster. Anyway, also coming up this weekend is VIP … Well, actually it's not coming up, it's not until May 9th and 12th but I want to tell you about it. It's called The 2016 VIP Workshop. The reason I'm telling you because as I'm recording this right now, it's Saturday, today is March 5th, and I believe our pricing ends on the 15th. The VIP Workshop, what it is it's an event for Enterprise WordPress users or their customer. As a leading provider of WordPress Solutions, it's put on by Automatic, by WordPress VIP Division. It's a 10 city developer workshop. It's held in Napa and the cost, I believe, is about $3,500, goes to $4,000 after the early bird pricing. Just want to put that out there, that if you're looking to go to Enterprise level conference, it's a week long, 9th, 10th, 11th, and 12th in Napa. I'm pretty sure it includes room and board I would imagine, as far as your room an food. I'm not 100% sure. I'll put a link in the show notes. Check that out if you're interested in that. Again, Work Camp Mumbai and VIP Workshop is not until May but the over pricing ends March 15th. Okay, what else? Segment one, move along here in the news. I missed it. I guess in about a week's time frame, WordPress 4.5 Beta One came out and now we're at Beta Two so I totally missed Beta One. From Beta One a couple things that were notable, responsive preview of your site. It's in the customizer now. Them logo support, inline link editing. What else was in there? Oh yeah, comment moderation improvements, so enhance experience with modern incumbents, including preview and rendered formatting, and there's an optimization of image generation. It reduces the size up to 50% so it's awesome. It may take, maybe move my need because I use Tiny PNG a lot, that service, tinypng.com. That's how I do a lot of my image optimizations. That is … Yeah, WordPress 4.5, Point Two. Yeah, Beta Two, so that was it, those main things. I'm sure we'll see Beta Three and then maybe release candidate one or two, and so we'll check that out in the next few weeks. I haven't even installed it. I have a test site that I usually do this with. I haven't had the time to install it but I will by the next week and I'll let you know how that goes and what's cool about it. All right, what else? Oh, also in the news, Pressnomics as you know, was this past week. I didn't go but what I heard and what I gained from it was there was an interview with Alex King. Alex King, for those of you who don't know, he started working with WordPress in 2013 … I'm sorry, 2003. He had his first commit to Core in the over 300 numbers, 325 I believe, and he is the founder of Crowd Favorite. He's been around … He was around for the early days of WordPress and started the company which was one of the first truly WordPress focus agencies. He passed away and there was a very moving and historical interview done with him soon before he passed away last year. There's a video of it, I'll put it in the show notes. It's really well done. It's … What the word? It's emotional, it's interesting to hear his history and his thoughts on all that stuff that he did, so it was pretty interesting. Thanks to, I think it was … I can't think of his name, from Pagely. He is the one who produced that interview, Alex King. That was an interesting moment there so check that out if you want to hear more about Alex King and what he did in the WordPress community, he was really, really amazing. He raised the stage for a lot of us, for what we do now. For all the small agencies, he was the first, he really was so we owe a debt of gratitude for that. All right, moving along now to segment two but before I do that I want to say thanks to my host, to my sponsor … My host … My sponsor which is A2 Hosting, and I want to mention WordPress Services. I always tell people that WordPress is “easy” but it's easy to a point. After that, there is a learning curve. It's either time or money, often both of yours … Your time, your money. If you don't want to spend the time and you have a little bit to invest, check out A2 Hosting's Managed WordPress Service. It'll take the confusion and complexity out of the way and it will give you what you really need, performance, reliability, and a great support group. You will honestly pay a fraction of what some other managed services cost, like about a third, seriously. Again, thanks to A2 Hosting, check out their managed services, if you need that. If you want a chance to win a year hosting, head over to kitchensinkwp.com/A2hosting. We're trying to give away a year of hosting. Okay, so again, thanks to A2. What else? We're moving along here. Segment two. Oh yeah, the meat and potatoes of today's show, Five Ways To Engage With Your Customers Or Clients. Five ways to stay engaged with your customers and clients. After my last WordPress 101 course that I taught a few months ago, I had a series of conversations with some people from class as well as some people just in the community, and it all pointed to the same topic. What are ways to stay in front of mind for clients and customers? I got to thinking, what are the ways? After you've done the job or if you're doing retail, how do you stay in front of people? This isn't necessarily just WordPress related, this is just marketing and business related. I want to share this with you because I think I've got these five pretty well dialed in as far as I know what they are. I do them, not all of them but I do some of them and I need to do better, I think we all can. Here they are, five ways to stay engaged with your customers and/or clients. First and foremost, email, email newsletter. It's the granddaddy and still the strongest way. Getting people that when you opt into something they're giving you permission to contact them and to stay in touch. You can use a service like AWeber or Mail Chimp, even Convert Kit. I'm looking at this myself. My buddy, Dustin, recently moved over to Convert Kit and he explained on his podcast why he left Mail Chimp to Convert Kit. Mostly because it was financial. He has a large mailing list and it was starting to cost him money over at Mail Chimp so Convert Kit has a better tagging and segmenting feature. I'm looking at it myself. I use AWeber currently but I may bail and go to Convert Kit. We'll see. Email newsletters have a lead magnet, give away something for free. I give you my email address so that I'm on your email list and I get something. I get a PDF, an e-book, something. I'm working on that right now, actually. I have one almost done. I have all the content there. Just need the formatting, proofreading, and who to get it set up. Okay, so number one, email newsletter. Number two, a live chat option. This could be available for a pre-sales question or even tech support. You can have hours on this when you're available. There are a couple of services that do this, a lot of plug-ins actually do this for WordPress. One of the bigger ones, the service is called Olark and so Olark is there. WPMU has a service, has a plug in for it. I'm considering this myself actually for Concierge. When I run Concierge WP, I was thinking I could put myself available for a couple hours during the day for the pre-sale support. Actually, that's how I would use it, pre-sales. That way, if people want to confirm what I do, I would do it that way. I might use Olark, I would probably go with Olark. Have a free level and a pay level, keep it different levels like that. WPNU has one, et cetera. There's a whole bunch. If you type in live chat in the plug-in repository, you'll find a handful of them so that's one way. Another way to stay in front of people are doing surveys. Ask your customers and clients what they want in products, in services or both. Ya know, I just did this recently with my last class. I said, “Hey, I may very well put together a refresher course or offer WordPress 102, something online” Actually, I offered how do they want to be educated this way, what do they want? What classes would they take? How much would they pay? What's the best way for them to take it, in person or online? You can use many ways. You can do Poll Daddy. You could do Gravity Forms. I did it the old fashioned way, I did an email real quick because my list was pretty small on this specific segment. If I had a larger place and I wanted to really ask a whole bunch of people and get analytics back, I would probably use Gravity Forms for that. You can do surveys through Gravity Forms or Poll Daddy or Google Forms. Doesn't really matter how you do it, just do it. Ask the survey, ask what people want and then that way you know you're not something or wasting your time, and you can really just go ahead and serve them best. What else? Two more here. Live video. You can host a Q and A session or give an update on your services via, let's say, a blab. Blab.FM. It's a relatively new service, really cool, and you can do that once a week, once a month, et cetera. Or Periscope, if you want to just say, “Hey”, show people your latest offering. Something if you have a store, store front, retail, brick and mortar, you could do a Periscope. The other one I just came across yesterday, which I knew about but I've never messed with it was Zoom. Do they call it Zoom? Let me double check here for a second. Yeah, Zoom, Z-O-O-M. You can do a webinar that way but do some type of live video. Just that way you can stay in front of your customers and you can let them know via email. Then last but not least, social media. Of course, Facebook and Twitter. Those two are huge still. Even though Twitter recently reported a drop in subscribers, they're still strong out there. I still like Twitter. Facebook, I like it, I use it all the time. You can have a Facebook group, a private group, you can invite people onto that if they've bought a class or a product or a service from you. That's one way to stay in touch. Social media would be another way to do it. 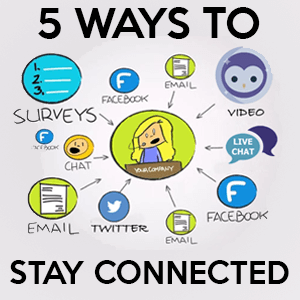 Once again, five ways to stay in touch and engage with your customers. Email newsletter, live chat, surveys, live video, and social media. Those five ways, I think are a pretty good breadth of … Pick one or two and just do those. You don't have to do all five necessarily because, let's say live chat might not be right for what you do at all but live video might. Or email newsletter, I think across the board, email newsletter by far is one of the strongest ways to go. Social media, Facebook, Twitter, yes, private groups. Twitter, you could offer specials. Tweet something out, come get it. Today only, et cetera. Those are different ways I would suggest staying in touch with your customers or clients. That is that for segment two. Segment three, moving along here, tipping toward the week. For those of you who do write a bunch of blog posts or just write a lot … I don't do a ton of writing myself currently on Kitchen Sink site, but for those who do I would suggest, if you need help with your grammar is … I would need help with my grammar … Check out Grammarly. It's a free Chrome add on and it helps with your grammar. Simple really. I'll put a link in the show notes, check that out. Actually, I just added it this morning and we'll see how that goes. We'll start doing … I think I can use it across the board. Not just blog posts but just writing emails et cetera as well. We'll see how that goes. All right, so that is it for this week. If you have any questions or comments, go ahead and send it over your email. Adam@kitchensinkwp.com or use the speed button functionality on the website. Thanks again for listening. Thanks for being here. Totally appreciate you and we'll see you next week. Go out and do some awesome things with WordPress. Thanks. Bye bye.